Get You Some of That Fruit Slicing Fun In! First of all, what can we say about Fruit Ninja that has not already been said? If you are not familiar with this mainstay game, it is an arcade style romp in which you swipe the screen with your fingers to use your blade to slice fruit! And how cool is that?! Created by Halfbrick Studios, the Fruit Ninja series appears on so many platforms we are tempted to say, you know, all of them - but its appearance here as a mobile app/game offering the perfect combination of addiction levels and game play in bite-sized chunks says most of what needs to be said about that. 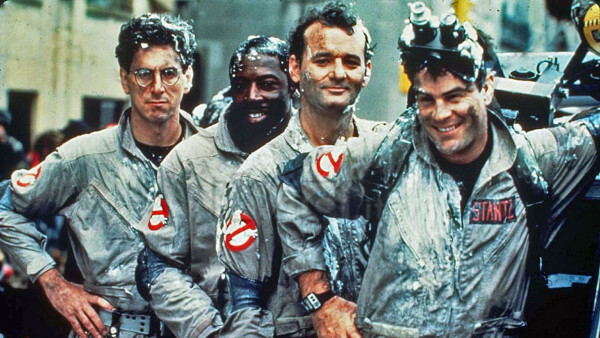 What makes this one stand out is that it is an homage to one of our fav movies: Ghost Busters! That's right - to celebrate the 30th Anniversary AND Halloween they made this new version that is both updated and tweaked to make for very smooth and excellent fruit-slicing action. Well, as long as you know, you avoid slicing into bombs and capture packs. We're just saying. The game is free to download - and free to play - and is supported by advertising in the form of pop-up ads that can appear between missions. 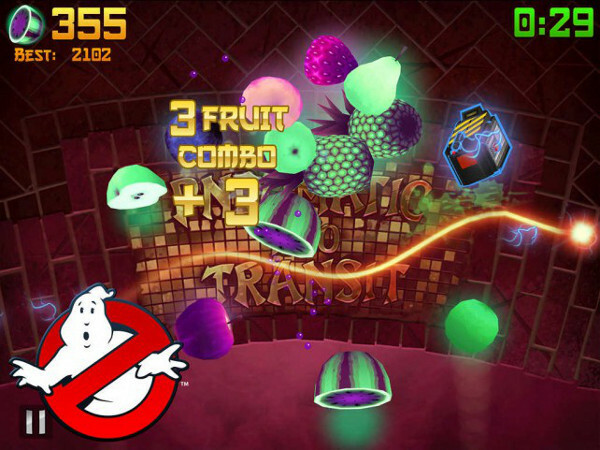 The game uses Starfruit - its premium currency - for the purchase of blades, dojos, and power ups. Those are optional purchases strictly speaking, but if you get stuck by the Fruit Ninja Addiction, maybe not so optional for you! The cost for IAP here is based on the amount of Starfruit you buy - the packages are priced at 100 Starfruit @ Free (you have to watch a video) -- 5,000 Starfruit @ $1.99 -- 15,000 Starfruit @ $3.99 -- 50,000 Starfruit @ $14.99 -- and 200,000 Starfruit @ $49.99. What can you buy with that Starfruit? For Dojos the Classic Fruit Ninja Dojo and the Cherry Blossom Dojo are both 1500 each. Additional blades can be purchased based on the level you have reached - for example Old Glory (slow-motion special) and Cloud Kicker (Each fruit bounces back once) are 1000 each. Then there are the standard power-ups at pretty low cost - they average between 80 and 120 Starfruit each. In terms of game play longevity Fruit Ninja has it in large numbers. Put it this way - if this is your first taste of the FN you are gonna be hooked. And all things being equal, the possibilities of this game ending up in your regular game play rotation? Yeah, pretty certain! Because why? Because you get to slice fruit. Lots of fruit. For points! Graphically speaking the game is a treat - bearing in mind that you are in a cartoon world, slicing cartoon fruit of course. The point though is that the game is every bit the high standard of the FN series, and offers eye-pleasing game play experiences. Where it really shines though is the music and sound effects. 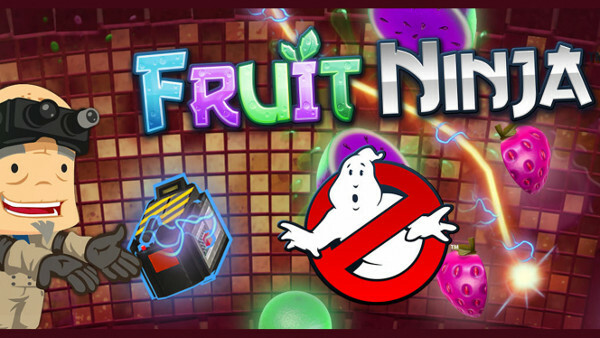 As previously noted this newest addition to the series celebrates the 30th Anniversary of Ghost Busters - so naturally it comes with spooky background music that certainly sets the stage for fun and haunted fruit adventure! The sound effects include slicing fruit - of course - but also sports special sound effects for when you cut into a haunted fruit or hit one of the specials like a 4-fruit slice, a critical hit, and the like. In short it is everything you could want in an FN game! It's really hard to overstate our satisfaction with this title. 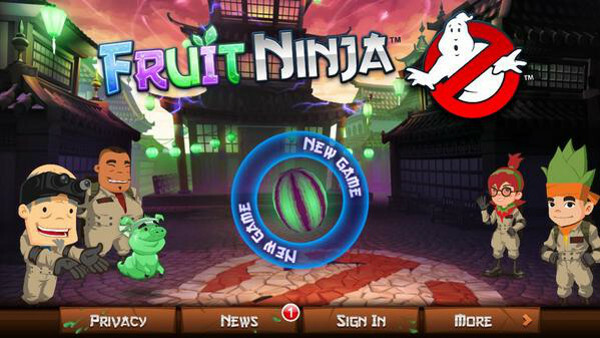 Even if you already have a Fruit Ninja Game this one is worth having if only because of its homage status and fun/funny take on the series! Then there is the whole - this game is FREE vibe - and well worth it at five times that cost. The real warm fuzzy feelings come when you get to the tally screen and you get your bonuses - like the No Bombs, and 6-Fruit Combos - piling on the sort of score that sees you level up and saying to yourself, hey, self! I am a Fruit Ninja! Good times were had by all - and once you play this one you will fully understand how it not only earned a perfect 5 out of 5 score from us - but it also earned a spot in our daily game play rotation list! Yes, it is a keeper! Pet Rescue Saga is the new hit puzzle game ..
Release the magic and download Candy Crush ..
From the makers of the hit game Candy Crush ..
Switch and match your way through hundreds ..